Factors affecting the effect of automatic casting on strap LIU Cheng;HOU Jingxiang;DENG Jidong;Tianjin Yuasa Batteries Co.
Research progress of carbon materials added into the negative plates of lead-acid batteries CHEGN Zhiming;HAN Shengbo;YU Qian;CHENG Gao;HU Mengjuan;Henan Chilwee Genshore Power Co. The effects of negative additives on charge acceptance of lead-acid batteries CHEN Zhixue;BI Xigang;ZHU Hongying;KONG Demin;LIANG Hongyu;SONG Yichuan;WANG Huaiyu;Fengfan Co. 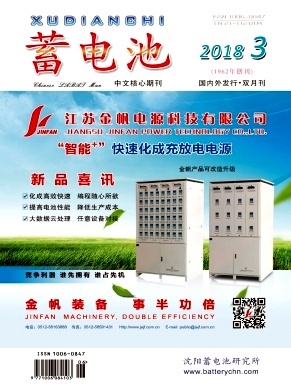 The application of intelligence cloud BMS in the substation HUANG Shihui;YANG Zhongliang;WANG Rugang;Shenzhen Pluke Intelligent Test Equipment Co. Discussion on positive formula of gauntlet EV lead-acid battery GUO Jingdang;JIA Leike;Jiangsu Suqian Leike Power Supply Co. Discussion of preparation of negative plates of lead carbon batteries XU Xiaoliang;XU Dongming;Shuangdeng Group Co. Effects of positive plate curing process on the performances of lead-acid batteries YAN Xinhua;MA Hongtao;ZHANG Kai;LI Juan;Henan Chaowei Power Co.
Study on a highly reliable terminal sealing structure for lead-acid battery ZHANG Xudong;WANG Lizhai;ZHANG Lifang;Fengfan Co.
Development status and prospect of the separators used in lead-acid batteries ZHAO Haimin;ZHANG Tianren;WU Zhongfei;ZHAO Ruirui;Tianneng Battery Group Co.